Okay, all of us here at Government Book Talk love our Government books, but we also know that some of them are…unusual. Sometimes a particular title becomes a sort of shorthand for the whole category of strangely and obscurely titled Federal documents. At one time, the book that summed up this exotic aspect of Government publications for my colleagues and me was the Nuttall Tick Catalogue – or to cite its more euphonious full title, George Henry Falkiner Nuttall and the Nuttall Tick Catalogue. In fact, just a few weeks ago I received an email from a former colleague (from Greece!) congratulating me on this blog and asking if I planned to do a post about the Tick Catalogue. 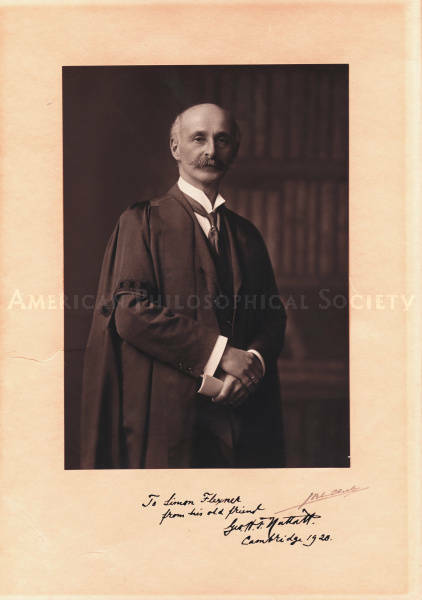 It’s the perfect oddity: as the Preface states, “”This publication brings up to date, in a slightly revised form, Nuttall’s ‘Catalogue of Ticks,’ a three-volume handwritten journal, never before published.” Given that Dr. Nuttall (pictured above) died in 1937 and that the Catalogue was not published by the U.S. Department of Agriculture (USDA) until 1984, it doesn’t seem as if the world was in a rush to see it in print. A closer look does tend to bring things into focus. Dr. Nuttall himself had quite a distinguished career as a biologist, as well as a brief stint as a special constable during the aftermath of the San Francisco Earthquake. He was the founder of the journal Parasitology, and indeed of the field of parasitology, a leading researcher into the transmission of diseases by parasites, and the discoverer of the bactericidal properties of human blood. He concluded his career as Quick Professor of Biology at Cambridge University. The editor of the Catalogue, J.E. Keirans, apparently is still active as a researcher. His specialties include ticks (of course) and the detective stories of John Dickson Carr (particular favorites of mine as well – I think The Three Coffins was his best). I really can’t comment on the Tick Catalogue’s value as a scientific document but, given Nuttall’s very distinguished career, I’m convinced that USDA had good reason to make some of his work more widely available, albeit it was not the stuff of best sellers. Of course, that’s one of the noblest functions of Government publications – to make valuable information available regardless of how narrow a niche that knowledge may occupy. We also owe thanks to J.E. Keirans, who labored so diligently to bring the Catalogue to light. I couldn’t find the text of George Henry Falkiner Nuttall and the Nuttall Tick Catalogue online, but a number of libraries do have it. For more wildly and wonderfully titled Government publications, go here! This entry was posted on Tuesday, June 8th, 2010 at 8:47 am and is filed under U.S. Department of Agriculture. You can follow any responses to this entry through the RSS 2.0 feed. You can leave a response, or trackback from your own site. I found that there are a few copies of the ‘George Henry Falkiner Nuttall and the Nuttall tick catalogue’ available from Alibris.com Prices range from $25-$75.